This yoga fitness flow is another nice way to strengthen the core while aligning the bones in the spine with the rolling forwards and backwards required in the transitions. The splits actually seems easier to enter than the Plough pose which has the legs together. Perhaps because there is more room for breathing. I prefer to enter the splits version first. The third pose is a pose were you bring the legs to the body while lying on your back. It is a great pose to enter before entering the Shoulderstand, Plough pose or any of the other variations. 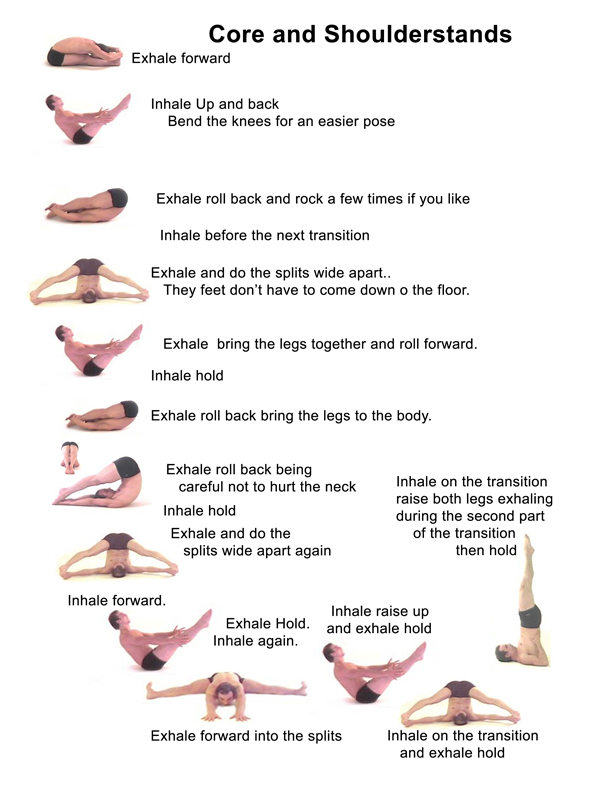 From the forward bend inhale up and and exhale into the Boat pose. Hold for an inhalation and exhale back to onto your upper spine. If you want hold boat pose for up to 5 breaths. Bend the knees if it’s too hard of strains the back. Roll on the spine as you breath and exhale into the splits on the Shoulders. The hands are shown grabbing the feet but you can just place the hands into the spine and take the legs down as far as you can comfortably.